“We were both needed a hug,” said McIlroy of his bromance with the Spaniard. No wonder. He was six over after his first eight holes as he went out in 42. Almost 12 months after coming home in 43 en route to a final round 80 last year, he was almost grateful that it was only the third round. After opening with a damaging double bogey at the first for the second time this week, the US Open champion bogeyed the fifth and then three putted the seventh from four feet for double bogey before dropping another shot at the eighth. Inside, he was almost certainly crying his eyes out. McIlroy considered his driving the key to his downfall, yet he hit more fairways (8/14) than Phil Mickelson, who came home in 30 and shot a 66 to trail Hanson by a stroke on eight under par. Just a shot off the pace starting the day, the world No 2 careered to the turn in six over par 42 after a horror start and never looked like recovering from the moment he three-putted the par-five 13th for par. McIlroy tallied 31 putts for the day after taking 29 and 30 putts for the first two rounds - not bad on the average tour course but not what’s required to win a Masters. In contrast, title favourite Mickelson had just 26 putts as he followed nine straight pars on the front nine with a six under par 30 on the back nine for a 66 to trail 65 shooter Hanson by a stroke on eight under par. McIlroy’s bad dream started when he carved his tee shot into the trees at the first and hit a low runner from the pine straw through the green onto a spectator path. Unable to claim a drop, he clipped his third over the green then watched in agony as his fourth stopped at the top of a tier and trickled back down the slope, finishing 18 feet away. Two putts later it all added up to a double bogey but the pain was only just beginning. Bunkered off the tee at the par-five second, he missed from 15 feet for birdie and then did well to get up and down from the front bunker for par at the par-three fourth. A bogey at the fifth put him on the defensive but the wheels came off for good when he double bogeyed the seventh. In the right trees off the tee, he played a low runner through a narrow gap to the mouth of the green, chipped to four feet short of the back left pin but raced his par putt four feet past and missed the one back. A bogey at the par-five eighth left him eight shots off the pace and while he followed a bogey at the 11th with a birdie from six feet at the 12th, he three-putted the 13th for par, throwing away a great chance to mount a recovery having hit a career approach to the green. He missed another birdie chance from around six feet at the 14th, chipped and putted for birdie at the 15th but then bogeyed the 17th, when he followed a nice chip from the back of the green with a poor putt from around four feet. He ended the day with a smile when he came within a couple of inches of holing out for an eagle two at the last. He’s mature beyond his years, a world class golfer and a Masters champion in waiting. Jordan Spieth? No, Rory McIlroy, who must face up to the fact that he has a problem getting his mindset right at Augusta National. McIlroy tosses his ball into the lake the 15th in frustration. 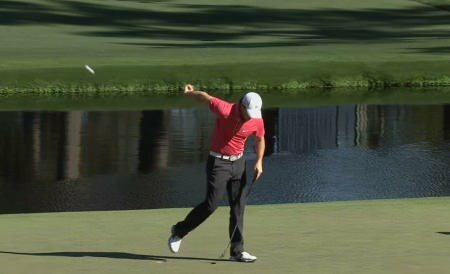 Rory McIlroy’s Masters hopes ended with another spectacular Augusta National meltdown.